When are you open? Check our opening hours at our calendar. Where is the ticket sales booth? From June to August, the ticket sales booth can be found at the main gate, and at other times inside the water park. See the area map. When is the ticket sales booth open? The ticket sales booth opens at the same time the water park opens. Ticket sales booth closes ca. 1,5 hours before closing time, but you can still buy tickets from the Serena shop. How do I avoid queues? At holiday seasons the busiest time is right after we open, 11-13 o’clock. More cash registers are opened according to customer situation. Why do I need the wristband? The wristband is the ticket to the water park and it must be kept on throughout the whole visiting time. Are the outdoor and indoor pools available with the same ticket? When the outdoor pools are open, the entire water park is unlimitedly included with the wristband price. When is the outdoor water park open? The outdoor water park is open from June to August according to the opening hours. At what age can children come without a supervisor? Children 10 years and older with adequate swimming skills can come to Serena alone. Children under 10 years must always be accompanied with an adult guardian. I won’t be swimming, do I still need to buy the wristband? Everybody entering the water park area must have the wristband on. At summer season you can’t enter the main gate without the wristband and at winter season you can come to the restaurant, but no further from the ticket sales booth without the wristband. When can I buy the evening ticket? You can buy the evening ticket starting at 16 o’clock. What kind of payment methods do you accept? The payment methods are listed at our price list. Can I buy the ticket in advance? You can buy tickets in advance from our online shop or from cooperating hotels. Where can I buy gift vouchers? 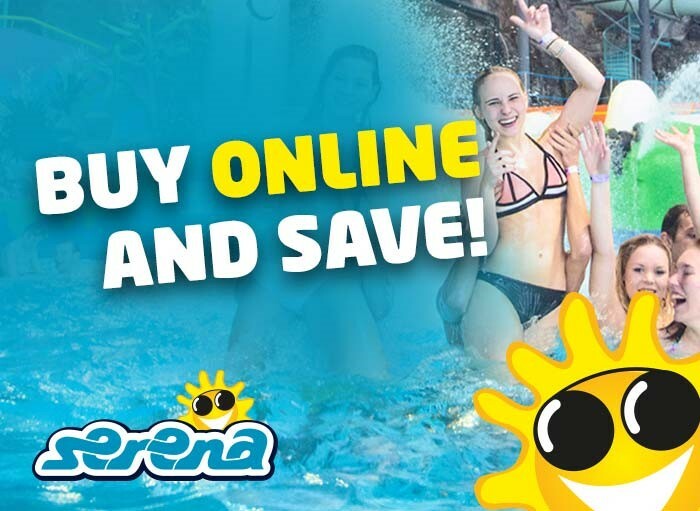 You can buy a ticket for somebody else from our online shop, but if you want to give a ”physical” voucher as a gift, you can get it from our online gift voucher store (will be sent to your address by post) or from our ticket sales booth at the water park. Can I pay with the wristband or load money into it? You can’t pay with the wristband nor load money to it. Does a personal assistant need the wristband? Please see the ’Accessibility’ section below for instructions. Can I go out of the area and come back the same day? The wristband is valid for the whole day, during which you can freely leave the area and return through the ticket sales booth. What is the validity of FunTour and Happy Pass tickets? FunTour ticket is sold during the summer season, and it can be used the days of your choosing, once in Serena and once in Puuhamaa. FunTour ticket bought in Serena must be used in Serena first. Happy Pass (second day visit) is sold all year round and it’s valid in Serena the following day from the date of purchase. The validity of the Happy Pass ticket can’t be extended. I have an online ticket/coupon/voucher, which has expired. What do I do? Online ticket’s, discount coupon’s and voucher’s validity is indicated on the ticket/coupon. They are not valid after the expiration date, and the validity can’t be extended. What kind of dressing rooms there are in Serena? There are two dressing rooms, one for the women and the other for men. There are no separate group/family dressing rooms. At what age should children go to dressing room according to their gender? Children under 10 years, accompanied with an adult, can go to opposite gender’s dressing room. Children 10 years and older should use the dressing room according to their gender. Our staff helps if needed. The age limit does not apply to children with special needs. How do the lockers work? The lockers operate with a 2 € coin deposit. Take a coin with you, exchange money or withdraw money from you card at Serena’s ticket sales booth or at the Serena Shop. You will get the 2 € coin back from the locker. One locker fits for 1 to 3 persons depending on the amount of belongings. Is there a separate storage for valuables? Wallets, jewelry, cell phones and other valuables can be stored at Serena Shop’s safety lockers. You get the key at Serena Shop, daily rental fee is 2 €. Where can I store larger bags that don’t fit into lockers? You can leave them for example at Serena Shop for storage. Storage is on your own responsibility. Can a stroller be brought to dressing rooms or pools? There is enough room for strollers in both the outdoor and the indoor water park, but they shouldn’t be stored in the dressing rooms where they can be an obstacle to other customers. Strollers can also be left in the cloakroom next to Serena Shop. Where is the lost and found? The lost and found point is in Serena Shop. You can ask for your lost property via e-mail, [email protected]. When you are coming to retrieve lost items, please contact us in advance so the items can be brought to ticket sales booth to be picked up. Where is the information point? Serena Shop is the information point. Can I rent towels or swimsuits? Serena doesn’t rent towels or swimsuits. We recommend that you explore the range of products sold in Serena Shop. There are towels and various types of bathing suits for women, men and children. What kind of saunas are there in Serena? There are two saunas both in women’s and men’s side. There is also a common steam sauna, where the women’s and men’s sides are separated with a wall. Saunas can be found in sauna cave in indoor waterpark. There are no saunas in the dressing rooms. Should I bring my own seat cover to saunas? There are disposable seat covers at saunas. What kind of pools, slides and activities are there in Serena? See the slides and activities. What kind of restrictions are there in the slides and pools? The person should always have sufficient swimming skills considering the difficulty level of each activity. More detailed instructions can be found on every slide’s information board. In Half-Pipe the maximum combined weight of 1-2 persons is 140kg. There are no other weight, length or age restrictions in Serena’s pools and slides. Regarding young children, always consider the depth of the pool. How the pools and slides are open? The slides and the outdoor pools are closed 30 minutes, and indoor pools 15 minutes before the park closes. Normally all the maintenance work is scheduled to be done outside of the operating hours, but Serena reserves the right to maintain pools and slides during the operating hours if needed, without prior notice. What kind of swimsuits are accepted? In Serena you have to have a swimsuit that is meant for swimming. You can use swimming shorts. For example for health reasons you can use a more covering swimsuit, as long as it’s made of swimsuit material. Use of non-swimming suits in pools is forbidden. There shouldn’t be zippers, staples or anything else that can scratch the water slides. Serena is not responsible for broken swimsuits. Does my child need a swim diaper? Children that use diapers should also use a swim diaper in the pools. Swim diapers can be purchased from the Serena shop. Where can I find water park rules? The rules are stated at our web site and at the park’s information boards. What is the temperature of the pools? Jacuzzis and the Kid’s land indoors are +32 °C. Other pools are +28°C. The outdoor pools are also heated to the same temperature, although there is little variation due to weather conditions. The waters of the outdoor park slides are slightly cooler. Are the outdoor pools open if it rains? Outdoor pools and slides are open through the whole summer season despite if it’s rainy or sunny. As thunderstorm approaches, outdoor pools may need to be temporarily closed, but however, they are usually quickly reopened during the same day. Due to exceptionally strong winds, some outdoor water park slides may have to be closed, but this is very rare. Can I take swimming toys to pools or slides? Swimming toys can be taken to pools, but not to slides or saunas. Large swim rings or mattresses are not allowed. Where is the first aid? The first aid station is by the main pool indoors. A disabled person pays the normal rates, and the assistant gets a free entrance to the park and can access the activities free of charge with the assisted person. A disabled person can prove the need for an assistant with the EU Disability Card (with an A-marking) or with other kind of official document. Serena may also grant an assistant free entrance on a case-by-case basis. The free entrance policy requires that the person with the need for an assistant has paid the entrance. In principle, free entrance is granted to one assistant. As a rule, the assistant must be at least 18 years old. A minor may also act as an assistant on a case-by-case basis. As an exception, an assistance dog is allowed for a visually impaired person. Bringing animals is forbidden in general. Serena has an unobstructed access and passage. Please note that access to pools and slides takes place via stairs, where access with a wheelchair does not exist. Our facilities include an accessible toilet. Toilets for disabled can be found next to the restaurant Granina and next to the saunas. How about dressing rooms? Dressing rooms have a shower chair. A shower chair with wheels is also available upon request. There are clear signs at the park. Our staff will instruct you if necessary. There are disabled parking spaces. Disabled parking is free. The parking spaces are located close to the entrance. What kinds of dining opportunities are there? See the restaurants. Are there vegetarian options? What about other special diets? Our restaurant offers vegetarian food. In the case of a vegan diet, please be in touch with us in advance. You can inquire about special diets in advance by e-mail at [email protected]. Can I bring my own food? You can eat your own food at the outdoor park or in the picnic area indoors. Eating own food is not allowed in the dressing rooms or other places inside. Bringing glass bottles to the water park area is forbidden. The tables at the restaurants are reserved for restaurant customers. What’s the dress code for the restaurants? You are welcome to all of our restaurants and cafés also with a swimsuit. During the winter season, the water park’s restaurant Granina also serves the ski resort customers. Are alcoholic beverages available? Alcoholic beverages are sold both indoors and outdoors. How do I reserve a cottage? The easiest way is to reserve via online reservation system. You can also call or send us an e-mail (check out our cottages). The cottage must be booked no later than the day before arrival (online reservation) or on the same day’s reservations by telephone before 12:00. I booked a cottage, how do I get to the water park? Water park tickets or ski passes are included in the rental fee for the days the water park is open. You can come to the water park right after the park is opened. You get the wristbands from ticket sales booth. The cottage rental includes water park tickets for all guests, for all accommodation dates. While staying in the cottage, how can I move to and from Serena? Those who have made a cottage booking get a code that works for the cottage and gate throughout the reservation period. Where can I leave my car? You can leave your car to the cottage for the time of the reservation. Before that, the car must be parked in the parking lot. After the reservation time you’ll have to drive it outside the Serena area. How can I reserve a beach chair? Beach chairs are free, so no reservation needed. Please consider other customers. How does the parking work? Parking costs 1 €/h or 5 €/12 h. Payment with coins, card or with Easypark app. Disabled parking is free. Where can I smoke? There are smoking places with colorful ashtrays outdoors of the water park. Smoking is also allowed at some of the outdoor restaurant tables. Please consider other customers, smoke only at the designated smoking places. This also applies to electronic cigarettes. Is it okay to take pictures? You can take pictures of your own group. Please consider other customers. Can I bring pets to Serena? You can’t bring pets to the water park, the only exception is an assistant dog for a visually impaired person. If agreed in advance, you can bring pets to Serena cottages. Cottages that allow pets can be provided with a separate reservation and a 30€ cleaning fee.